Marketa Samalova, Mark Fricker, and Ian Moore. This new edition of Fluorescent Proteins presents current applications of autofluorescent proteins in cell and molecular biology authored by researchers from many of the key laboratories in the field. Starting from a current review of the broad palette of fluorescent proteins available, several chapters focus on key autofluorescent protein variants, including spectral variants, photodynamic variants as well as chimeric FP approaches. Molecular applications are addressed in chapters that detail work with single molecules, approaches to generating protein fusions and biosensors as well as analysis of protein-protein interactions in vivo by FRET, fluorescence polarization and fluorescence cross correlation techniques. A number of approaches to in vivo dynamics are presented, including FRAP, photoactivation, and 4-dimensional microscopy. Behavior of spindle components, membrane proteins, mRNA trafficking as well as analysis of cell types in tissues and in development are detailed and provide models for a wide variety of experimental approaches. In addition, several chapters deal directly with the computational issues involved in processing multidimensional image data and using fluorescent imaging to probe cellular behavior with quantitative modeling. 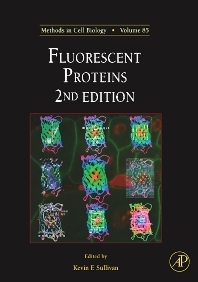 This volume brings together the latest perspective and techniques on fluorescent proteins and will be an invaluable reference in a wide range of laboratories.